It’s that difficult second album time for the peerless Mr Dispenser. It’s been nearly a year since I was asked to review his first book and a lot has changed since then. I’ve got older while it seems pre-reg’s have got younger, and the category M pot has become negatively correlated to pharmacy work-targets. How could this book keep up with all this, did it need to, and most importantly would it make me laugh so hard that it hurt for a day afterwards? You see, after the success of his first book it’s wouldn’t be enough for ‘Techs, Drugs and Birth Control’ to be a middle-of-the-road 3-star offering so when I first opened it I knew my review could go only one of two ways: ecstatic relief over an accomplished second release or crushing disappointment such that I’d be reaching for the Twitter block button. So did this book live up to my hopes and expectations? Damn right it did, and once again I’m reminded what an honour it is to be working in the profession of pharmacy. As Mr Dispenser says himself, this is “‘OUR’ book” – members of the profession and our colleagues using social media to share the good times, lament the bad and celebrate the great. For me that is this book’s greatest strength: I can go from wetting myself with laughter (Apprentice pharmacy clichés) to genuinely reflecting on previous experiences (Perils of the language barrier) and be left wondering how I can improve the experience of my patients now (except for those patients so well described in Deliveries). But don’t worry – it’s mostly something to smile and laugh about: The show must go on is genius, but not as much as 9-5, and the Star Wars guide to pharmacy is brilliant with a generous helping of geek…and what makes all these so good is that despite being on Twitter most of my working day I had missed these conversations so it was all fresh. A recent HSJ article described how a trust prepared medical students for on-call shifts using video-game simulations that had tasks appear with the same frequency and location as a real shift: if pharmacy wants something similar it can save itself a load of hassle and money by making this book (and its predecessor) recommended reading on the MPharm. The Life of a Pharmacy Student by Sophie Khatib is enlightening, and whilst sections like Alternative OSCE and How to annoy your pharmacist are all written tongue in cheek there are some truths in there that will well prepare students for those realities not covered in the syllabus. 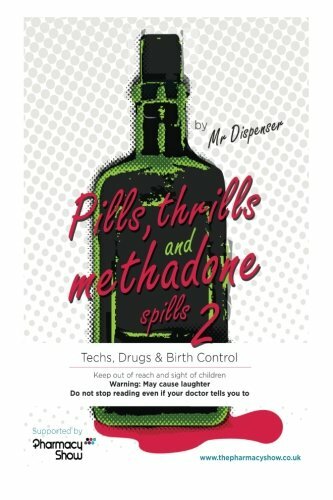 Helen Root’s Pharmacy guide to speed dating is great and there are some real pharmacy practice gems in there too, notably from Xrayser and Wee Neldo. In addition it’s great to be able to get an insight into some of the higher machinations of pharmacy development thanks to John D’Arcy. At this point I want to go on. I want to give you examples and snippets and quotes of all my favourite bits, but if I do, there won’t be much point in you buying this book because most of it would be replicated here. And you should buy it. Not only are 5% of proceeds once again going to the charity Pharmacist Support but it’s something that’s worth parting with your hard earned cash for. So go on: treat yourself and get the book either for Kindle or paperback: you won’t be disappointed.